So Kobe and the Lakers won? Good for them—and the little white kid cheering in the background —now let's get to baseball. Don't look now, but the Yankee's number one prospect, Austin Jackson, is batting .338 (4th in the International League) with 12 steals. He's also 3rd in the league with a .409 OBP and 10th in the league with a .858 OPS. Get the feeling that Xavier Nady, Hideki Matsui and/or Johnny Damon might be given the "Here's your Hat, what's your Hurry" treatment after this season? Watching the Yankees yesterday....and don't get me wrong, I love Hideki...but it was painful to watch him try to run. His legs are shot. Completely. He can still swing the bat some....but his days of playing the outfield are over. One more thing about yesterday's Yankees-Mets game. That was the reason I didn't want the Yankees to sign old Johan. His arm speed towards the end of his Twins career was noticeably lower than it was just a few years earlier. And in the American league, they would have ripped him. Face it, the National League and the American League are two different animals. For instance, his interleague ERA last year, was 4.05, way above his overall 2.53 ERA, and this year so far, his interleague ERA is 9.90. And if he had to face the AL East all the time....well, I think Santana's career might have looked a little differently. As the Yankees showed yesterday. You know, I'm happy that Dominic Raiola is excited about the Detroit Lions season, but did he really have to dig up Joey Harrington and rip him to show how good he feels about Matt Stafford? Interesting tidbit in my local paper, the Brooklyn Eagle. It shows how players who participated in the WBC are disproportionately more prone to be injured and miss time. It's a good read, check it out. Now that Jake Peavy is on the DL list for at least 2 months, watch all the buzz shift to Eric Bedard. 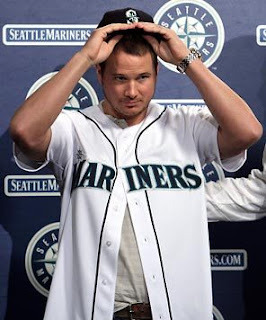 With Peavy's injury, and Bedard's 2.47 ERA, Bedard is now in the driver's seat this trade deadline. Interesting rumor about Shaq this morning. No, not the Shaq to Cleveland rumor, the Shaq to the Bulls rumor. Buzz is Luol Deng, Tim Thomas and others. Why? Because then they can dump Shaq's enormous contract and the end of the season to create cap room for......Lebron James. Have to say, it sound's plausible. Playing in a major market with Derrik Rose, Ben Gordan and Joakim Noah sounds a heck of a lot more fun than Eddy Curry and Jarod Jeffries. And finally, K-Rod....you're not exactly disproving the rumor that you're an overexcitible knucklehead. So relax, would ja? I didn't watch one minute of this year's NBA finals. I hate Kobe, even before his Denver trip. He has just always rubbed me the wrong way, and I just can't seem to care about Orlando at all. Hey Trav, how's it going. Austin Jackson, according to everybody is an athletic freak. Put him in CF, Melky in right, and maybe Damon/Gardner in left?